This bottle looks like it means business right from the start. I have been weary of trying any other steak sauces since I polished off a bottle of THT’s Garlic Lovers Steak Sauce, but it was indeed time to find a replacement or at the least something equally delicious. This bottle weighs in at a hefty 16oz. so there is no worry that this will be gone after just a few steaks. The initial smell is quite powerful and drool inducing. It has a sweet note to it with a pleasant smoky flavour following up. It is quite thick for a steak sauce, but pours out liberally and without hesitation in great uniform. The colour is very dark and there are flecks of seeds and spices scattered throughout. A very striking sauce in the smell and looks department thus far. The first taste was like a minor epiphany. No heat here, a bit of spice, but just an overall mouth filling sensation of an incredible sauce that perfectly compliments the steak. The manufacturers have really developed a superior sauce here and if it is any indication of the quality of their other products then I can’t wait to try them. Earlier I mentioned about the quick demise of my bottle of THT’s Garlic Lover’s Steak Sauce. Well there is room in the fridge for both of thia. 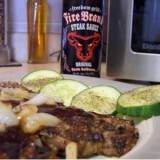 As the THT’s GLSS provides the heat and garlic for those looking for that extra something on their steak, this provides that perfect steak topping for others who may not be so inclined. There is a touch of heat but nothing that most people couldn’t easily handle. Ought to have more than a ‘sweet note’ to it. Yikes, look at all that sugar! Here’s one of the “games” that the food regulations allow us manufacturers to pull: we’re allowed to break out the different kinds of sugar. High Fructose Corn Syrup (#2 ingredient), Corn Syrup (#4), Molasses (#9), and Brown sugar (#12) are all essentially ‘sugar’. If we were not allowed to break them out (for whatever the rationale) then ‘sugar’ would be the #1 ingredient in a LOT of foods that you wouldn’t ordinarily think of as having sugar as the main ingredient. Most ketchups fall into this category as do a lot of breakfast cereals. This post is NOT intended to dog this product or the maker. It is simply taking an opportunity to enlighten the casual reader who might not have known some of the food code loopholes and who can now read a label with a bit more knowledge. Hi Jim, thanks for your input. Readers should be aware of that. I could have gone on a diatribe about the HFCS and other sugars in there but I decided to just focus on the taste. I don’t have any particular gripe against HFCS- it’s a useful ingredient and fairly benign in moderation. I just don’t agree with the regs that allow “tomatoes” to be listed as the #1 ingredient in ketchup, when in most instances it’s “sugar”. I bet that comes as a surprise to some folks- that there’s more sugar in some brands of ketchup than tomatoes! Most BBQ’s do indeed have a lot of sugar in them, mine also (brown & nothing else) so it wouldn’t be a surprise that they’d tend to the sweeter side. Some, however, are nearly ALL sugar (in it’s various forms) with only some flavor additives. CaJohn’s recipe surprised me when he asked me to make it (back in the day) because it had comparitively very little sugar- quite the exception to the rule. I just like to see folks have the information they need to make informed decisions rather than ban or regulate certain materials. Put knowledge in the hands of the consumers and they’ll sort it out pretty quick 😉 It might ebb & flow a bit, but the market does eventually sort most things out. jim campbell ladies and gentlemen. always the knowledge of all knowledgers. thanks for the bit of facts and information. always welcomed. Not sugar but HFCS could be the #1 ingredient. They listed ketchup as #1 and then only listed the ingredients of the ketchup as Tomato puree, (water, tomato paste) they then listed HFCS as a seperate ingredient. I suspect it is in the ketchup as well. Ketchup (tomato paste, corn syrup, water), High fructose corn syrup, Soy sauce (water, salt, spices), corn syrup, Worcesteshire sauce (water natural flavorings, salt, anchovies, corn syrup), yada, yada, yada. Take a look at some of the commercial BBQ’s and Steak Sauces & check them out- lots & LOTS of parenthetical elements in some of them! Actually I have, though I agree with you that it’s not very common. Can’t really remember where I first came across it (overseas?) but I remember thinking that it was too bitter and ‘tomato-ey’ for ketchup. Read the ingredient panel & saw no sweetners. HFCS is just nasty stuff! I always try to avoid it when I can. The SF Chronicle posted a good article about HFCS a while back. [Comment ID #108175 Quote]Thank you for the info. I can see why you are so well repected around here. Awesome. I’ve got a bottle sitting on the counter that Nick sent to me and we’ll have to give it a try tomorrow night. I’ve been hesitant to open it and start a review because this stuff is made by Freedom Grill, the guys who make those really cool tailgating grills that hang on the trailer hitch of your truck or SUV. I’m guessing that the grills were their primary product and their sauces were brought on board to compliment the grill, somewhat as an after thought. Typically this means an inferior product that is likely their label on someone else’s sauce. But in this case they say they did a ton of research and tasting before coming up with the formulas for their sauces. Good job guys!